Mercy is the name of the game. At least it is in the “new, improved” Catholic Church of today, which is such a sensitive listener. Of course mercy is crucial, but the new Church has put a different spin on it. Forget about the need for repentance, Mercy is for everyone, whether they want it or not! If the 60’s were all about “free love”, then these are the days of “free mercy”. But should mercy have no cost? Today the Pilgrimage of Mercy came to my town. This is the official name of a tour throughout the United Sates of the relics of the Church’s youngest martyr, Saint Maria Goretti. For this tour she was given the title “Little Saint of Great Mercy” because she forgave her murderer. Without diminishing this act of heroic virtue, there is perhaps another lesson to be learned from her story, one which was overlooked in the promotion of this tour; a lesson in sorrow for sin and amendment of life. Maria Goretti was only nine years old when her father died, leaving her to be a little mother to five younger children while his widow worked in his fields. Maria’s spirit strengthened and repaired the broken family. But two years later the neighbor boy, a young man whose father was an alcoholic and whose mother was insane, tried to force himself upon her while she was alone in the house. She declared that she would rather die than allow him to commit this sin, and in a fit of rage he stabbed her fourteen times and fled. Maria was found alive and doctors performed an operation on her without anesthetic, for fear of inducing cardiac arrest, but they were unable to staunch the internal bleeding. She offered up these unimaginable pains for the conversion of sinners, and before she died she told her mother, “I forgive Alessandro Serenelli and I want him to be with me in heaven forever.” She was canonized 48 years later by Pope Pius XII in 1950. 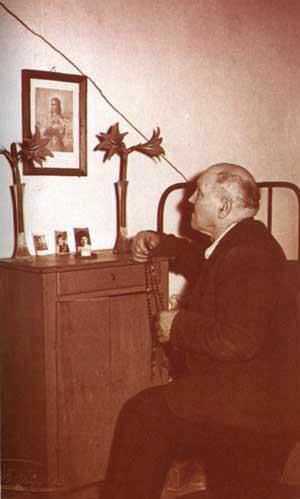 Her murderer (seen to the left praying before an image of the little girl he murdered) was invited to the canonization. By this time, he was a changed man. The eleven-year-old innocent who lay dying knew he would convert when she said that she wanted him to be with her in heaven. Consider what this means! She understood the gravity his sin; she died for it. And she knew that he would not be allowed into heaven unless he repented of his sin. Maria Goretti, unlike the “listening” Church of our day, asked a change of him. Yes, there was mercy, but the key player here was repentance; both in expectation and later, in reality. It is said that Alessandro went to prison the angriest man on earth. But there little Maria appeared to him, and though she did not speak, her entire aspect was one of forgiveness, and he understood. He converted on the spot. I am now 80 years old. I am close to the end of my days. Looking back at my past, I recognize that in my early youth I followed a false road – a pathway of evil that led to my ruin. Through the content of printed magazines, immoral shows, and bad examples in the media, I saw the majority of young people of my day following evil without thinking twice about it. Unworried, I did the same thing. There were faithful practicing Catholics around me, but I paid them no attention. I was blinded by a brute force that pushed me down the wrong way of living. At the age of twenty I committed a crime of passion, the memory of which still horrifies me today. Maria Goretti, now a saint, was my good angel whom God placed in my path to save me. Her words both of rebuke and forgiveness are still imprinted in my heart. She prayed for me, interceding for her killer. Thirty years in prison followed. If I had not been a minor in Italian law, I would have been sentenced to life in prison. Nevertheless, I accepted the sentence I received as something I deserved. Resigned, I atoned for my sin. Little Maria was truly my light, my protectress. With her help, I served those 27 years in prison well. When society accepted me back among its members, I tried to live honestly. With angelic charity, the sons of St. Francis, the minor Capuchins of the Marches, welcomed me among them not as a servant, but as a brother. I have lived with them for 24 years. Now I look serenely to the time in which I will be admitted to the vision of God, to embrace my dear ones again, and to be close to my guardian angel, Maria Goretti, and her dear mother, Assunta. May all who read this letter desire to follow the happy teaching of avoiding evil and following the good. May they believe from their childhood that religion with its precepts is not something they can do without. Rather, it is true comfort, and the only sure way in all of life’s circumstances – even in the most painful. This man gets it. It’s not only about mercy. In life there is pain, conflict, falling, but there is also rising up and starting over, and honor to be gained in trying. Shame comes with remaining in sin, not with accusing yourself and rising above it. The Church today, however, is perfectly willing to smile mercifully upon you as you stubbornly wallow in your own filth. Saint Maria Goretti (and Alessandro, if you’re up there!) please pray for your Church! This article appeared in a recent print-edition of The Remnant. To see what you're missing SUBSCRIBE TODAY.